Results: By expanding and rearranging certain connections, a rare molecule packs in two different metals, not just one, according to scientists at Pacific Northwest National Laboratory. This captivating molecule, a metal organic framework or MOF, expands by 33 percent when it takes in metals. Unlike most MOFs, the molecule forms and breaks bonds with the charged metals it carries. It is also highly selective, taking in only metals that are missing two electrons. As a bonus, this unusual MOF works as a solid. The features of this MOF, part of a small class of molecules called soft anionic MOFs, create possible avenues for manipulating the molecule's carrying capacity. "Not many MOFs can capture and incorporate metals like this," said Dr. Praveen Thallapally, a materials scientist who worked on the study at PNNL. "Maybe 0.05 percent of papers in the area report on these types of reactions, and they don't involve the MOF as a solid. 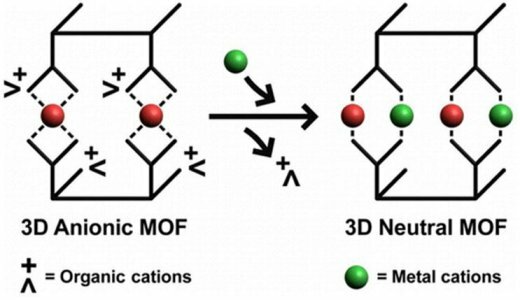 To the best of our knowledge, this is the first documented report of capturing metal ions with soft anionic MOFs in the solid state." Why It Matters: Reclaiming naturally occurring uranium from seawater to power nuclear plants, turning electroplating's waste stream into a profit source, and meeting numerous other challenges require solving the same problem: selectively extracting metals from a liquid. Scientists want to design a material that can capture certain metals. The soft anionic MOF they studied selectively picks up certain metals with a +2 charge, known as transition metal divalent cations. This study provides foundational knowledge about this promising capture material. "This knowledge is an important step," said Dr. Jun Liu, who leads PNNL's Transformational Materials Science Initiative. "This research could plug into a lot of different areas of interest, including batteries, sensors, nuclear fuel, environmental cleanup, and electroplating." Methods: The team began by synthesizing a flexible, negatively charged zinc-based MOF, called the parent molecule. They added the molecules to a solution containing cobalt cations, which are cobalt atoms minus two electrons. As the scientists watched, the solution quickly turned violet, indicating that the MOF captured the cobalt, creating a MOF that contained both zinc and cobalt, which was as expected. "But, we wanted to see what would happen next," said Thallapally. Researchers at Pacific Northwest National Laboratory studied a metal organic framework with a negative charge and a flexible structure. The framework captured positively charged metal ions, and in the process lost its charge. The team added the zinc-cobalt MOF to a solution with copper cations. The solution turned blue as the soft anionic framework picked up the copper. The result? A single MOF holding three different metal ions. The team experimented with different combinations and found that the MOF preferred divalent metal ions over alkali metal cations, such as sodium and lithium ions. The team measured the uptake of each metal at each step using ultraviolet spectrometry. Using a single-crystal x-ray diffraction spectrometer in PNNL's Physical Sciences Laboratory, the team determined that the material grew 33 percent larger when it took up the metals. As the framework picked up the positively charged metal ions, it slowly lost its negative charge and became neutral. As an added bonus, the team found that they could study the structure of the MOF without the guest metal. Typically, when the guest molecule is removed, the pore collapses, making it impossible to measure. The team analyzed the size of the pore where the guest metal resided. They also determined how the metals are oriented in the pore, how they bind, and what happens to the MOF structure and electron balance when they leave. "We are gaining significant insights into MOFs and what they can do," said Dr. Jian Tian, a postdoctoral research fellow at PNNL and first author on the study. "I am looking forward to building that knowledge base." What's Next? The team is looking at how the soft anionic MOF forms and how much of each metal is packed into the MOF. "The composition of each metal in the MOF has yet to be determined," said Thallapally. "That's next." Funding: This work was supported by the Engineering and Physical Sciences Research Council, and the U.S. Department of Energy, Office of Basic Energy Sciences, Division of Materials Sciences and Engineering. Research Team: Jian Tian, Lax Saraf, Birgit Schwenzer, Jun Liu, and Praveen Thallapally at PNNL; Stephanie Taylor, Euan Brechin, at the University of Edinburgh; and Scott Dalgarno, Heriot-Watt University. Reference: J Tian, LV Saraf, B Schwenzer, SM Taylor, EK Brchin, J Liu, SJ Dalgarno, and PK Thallapally. 2012. "Selective Metal Cation Capture by Soft Anionic Metal-Organic Frameworks via Drastic Single-Crystal-Single-Crystal Transformations." Journal of the American Chemical Society 134(23):9581-9584. DOI:10.1021/ja303092m. Ions are atoms where electrons have been removed or added. Anions are ions with added electrons, carrying a negative charge. The MOF studied is an anion. Cations are ions where electrons have been removed, carrying a positive charge. If a cation is missing two electrons, it is called divalent. The metals captured by the MOF are divalent cations. The shorthand version for a divalent cobalt cation is Co2+.